It never ceases to amaze me how creative coaches are getting with technology to help their players learn and understand the game of football. The spread offense can be complicated to learn, but we found a great set of videos to help your players get a great simulated look and feel of this offense. Now that the off season is here, I thought it would be a good time to look into my crystal ball and tell you what I see for the future of the spread offense. I think most would agree that the high school and college game has reached the momentum phase in regards to the implementation of this offense. A strong commitment is being seen at all three levels of college to recruit high school athletes to fit this system. What about the NFL? How is this momentum phase in major college football going to effect National Football League teams in the future and how they'll draft offensive players out of college? If you're reading this article, you likely already know the main difference between 'the spread offense' we're talking about today and 'the spread offense' of years past is the ability of the quarterback to run as effectively as a running back with the ball, and still be able to throw the ball with accuracy and effectiveness when needed. If you think of the spread offense's run by the likes of Warren Moon with the Houston Oilers in the late 80's and early 90's, it was based off a quarterback who threw the football with great accuracy and frequency, and only ran with the ball when flushed out of the pocket. The spread offense you see in college and high school today actually has designed plays for the QB to run, sometimes up to 5 or more designed runs or 'options' to run in the playbook based on how the defense reacts. Spread offense's of the past had maybe one designed QB run, a QB draw that was only run near the goal-line. If the defenses are so much better, then aren't the offensive linemen, running-backs, and receivers blocking for the running QB's that much better too? They came from the same talent pool of elite college players as the defensive player's, right? In addition, wouldn't you agree that a Vince Young type of dual threat NFL QB is much less likely to get creamed by a defense when he runs with the ball then say a Warren Moon of that era? 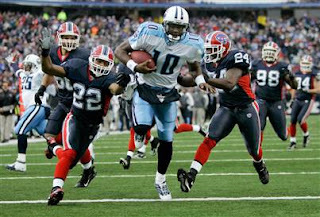 Vince Young is a runner who can throw the ball well enough to win, Warren Moon was a great passer who couldn't be expected to run the ball 10-12 times a game on designed QB runs because he just wasn't that type of athlete. My impression was always that a quarterback was much more defense-less in the pocket getting sacked then running in the open field on a designed run. So my point is this, with the likes of dual-threat college quarterbacks Dennis Dixon, Patrick White, Tim Tebow (2007 heisman trophy winner, a dual threat QB), Armanti Edwards, Terrelle Pryor (the most highly recruited high school senior this year), and others making such a splash throughout the college game, and high schools throughout the nation implementing run oriented spread offenses, isn't it just a matter of time before it makes its way into the pro game? A lot will argue that the spread offense you see in college and high school today is nothing more than a dressed up version of the old Oklahoma Sooner wishbone offense of the 70's and 80's. This offense never made it into the pros as many predicted, but I personally see a lot differences. First off, the wishbone offense didn't spread the entire width of the field with big, strong, fast, and athletic wide receivers like the current spread offense, and secondly, the modern day spread is run predominately out of the shot-gun, which allows these talented dual threat QB's more options in the passing game that the wishbone formation did not. Finally, back to my prediction for the future of the spread offense in the NFL. 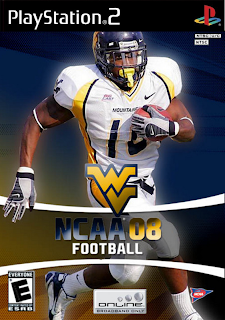 By the year 2011, an NFL franchise will make a commitment to the current spread offense we see today in college and high school game by first hiring one of the many college coaches who have evolved this offense. Names I think of are Rich Rodriguez at Michigan, Urban Meyer at Florida, Ron Zook at Illinois, or Chip Kelly at Oregon. What these coaches will do is have three (3) dual threat quarterbacks on the 53 man active roster every week. These QB's may even rotate into the game and all three may see some sort of action every week, as these offenses work best in a no huddle system. What NFL owners would be bold enough to try this first? Maybe a Daniel Snyder of the Washington Redskins, a Jerry Jones in Dallas, or an Al Davis in Oakland. Imagine an NFL team having quarterbacks Vince Young, Patrick White, and Terrelle Pryor on the same roster in 3 years, sign me up... I'll pay extra for that! I don't know about you, but I look forward to this day. I personally enjoy watching football much more on Saturday's as opposed to Sunday's, but that will all change as the stars of Saturday create a 'disruptive innovation' at the NFL level by 2011.